Laughing, father Lord pls have mercy on us. all pastors are fake. Yes, quote me anywhere.. YES I FULLY SUPPORT YOUR CLAIM. BLACK PEOPLE IN GENERAL AND AFRICANS IN PARTICULAR HAVE TO FINALLY WAKE UP. EUROPEANS DON’T BELIEVE IN ALL THESE NONSENSE WHICH THEY EXPORTED TO WEAKEN US AND WE ARE THERE DYING FOR THIS. NATURE IS TOO COMPLEX FOR ORDINARY STUPID HUMANS TO UNDERSTAND. It’s only m***ys that goes to church nowadays…..
how look will these quest be. it has lasted enough. God come by yourself and remedy the situation. This is totally staged or marine power. I refused to be deceived. This is a complete staged miracle. The Pastor cannot pray for the sick but can blind a woman for 10 minutes. Only Mumu will buy this crap. African people when are we going to wake up? This Pastor paid this woman to stage a false miracle in order to boost his business. 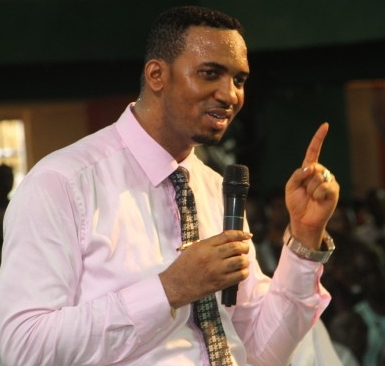 This Pastor targets the poor people, offer them money to testify wrongly. If you watch this video closely, as soon as he called the name blessing, his accomplice led the women to the podium. He did not even allow the lady to come out herself. Hhummmmmm……. miracle indeed. Every black man want easy breakthrough therefore the easiest route for them is to establish churches. I really pity those who were allowing this fake pastor laying his sinful hand on their head. Ask this man if he never had a problem. We need to stop viewing these fraudsters as men of God. Some of us even believe them than God. These liars thought God cannot come down immediately to judge them but all I know is your judgement days are imminent for saying God said when God did not say. We Africans love to denigrate us, when it is the white pastors who do these miracles, we say bravo, but when it is the blacks we say fake pastor, the interminable complex of black. Not all pastors are fake.To be candid when I never knew God in truth but just a church goer, I said all, many are saying here.The truth is you can not deceive God.once you are serious to serve God in spirit n truth n not just a church goer I promise you can even do great things than some of these pastors.These I have experienced.Those miracles you see are grace of God upon true Christians not only pastors.The question is God n demon who has greater power?.know well that Nigerian pastors go to America,Germany, london etc for crusade.Ask yourself if it is possible to deceive these foreigners.Again try and find out how many foreigners fly into Nigeria daily to seek for these pastors.Can they also deceive these millions of foreigners? Nigerian pls we should take time to examine things closely b4 we talk.powers of God are given to those who are ready for total obedience.